"Central part of Wilmington, N.C.," Published in Philadelphia by O.W. Gray & Son, 1882. North Carolina Collection call number Cm912c W74 1882. Selected maps from the North Carolina Maps project can be viewed as Historic Overlay Maps, layered directly on top of current road maps or satellite images. By fading or "seeing through" the historic maps, users are able to compare the similarities and differences between old and new maps, and to study the changes in North Carolina over time. The Historic Overlay Maps are presented with a historic map placed on top of a current Google street map. The historic map has been geo-referenced, meaning that it should line up very closely with the current map. Using the Google map interface and check boxes to the left of the map, users can zoom in and out, move the images around, turn the historic map image on and off, or fade the historic map image. Please see the Instructions page for specific directions. 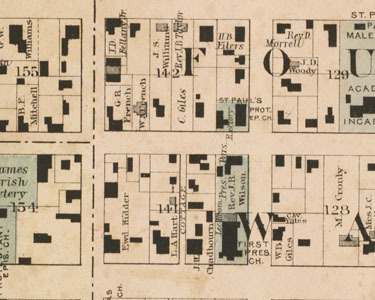 Select historic maps are available for download in a format suitable for use in Geographic Information Systems (GIS) software. Please visit the Davis Library GIS page for more information. Users can take a flying tour of North Carolina and view some of the Historic Overlay Maps in a 3D Tour of the Tar Heel State. The Historic Overlay Map display was developed in the Carolina Digital Library and Archives for "Going to the Show," a project documenting the experience of moviegoing in North Carolina in the early twentieth century. "Going to the Show" is funded by the Institute of Museum and Library Services under the provisions of the Library Services and Technology Act as administered by the State Library of North Carolina. The maps presented as Historic Overlay Maps were geo-referenced using the software Global Mapper. The image viewing window was developed using the Google Maps API.